MATTHIAS ELLIS. Matthias Ellis was married in 1692. We should expect him to have been born around the 1660s. No baptism has been found for him. He was ‘of Chagford’ when he married. The Chagford registers go back to the 16th century, but we have not found him there. He brought up his family in Moretonhampstead, but we have again failed to find his baptism in that parish. There were a number of Ellises in both parishes. The 1733 freeholders’ list tells us that Matthias Ellis was a yeoman, a farmer of some standing. JOAN WOODLEY. Again, we should expect her to have been born in the 1660s, or thereabouts. There is a possible baptism in Moretonhampstead. This would make her 26 when she married, a typical age. At this time, Jane and Joan were used interchangeably. The problem with this is that Robert Woodley had another daughter, Joane, baptised in 1679 Jun 10. There is no sign of Jane having died. Thirteen is also rather young for a marriage in 1692, but not impossible. Jane was the oldest of at least five children. Joane was the youngest. The children’s mother was Judeth Hutchins. Couples from rural Devon sometimes married in Exeter. This was true of Matthias and Joane, and also of their daughter Elizabeth. 1692 Dec 22 Mathias Ellis of Chagford & Joan Woodley of the same. The same day there was another wedding in Chagford. Marriage. St Michael the Archangel, Chagford. 1692 Dec 22 Matthew Ellis Elizabeth Woodley. There are striking similarities. We do not know how Matthias may have been related to Matthew, or Joane to Elizabeth, or why one couple chose to be married in Exeter Cathedral and the other in their parish church. Though they were said to be “of Chagford”, Matthias and Joane raised their children in the neighbouring parish of Moretonhampstead. At the end of his life Matthias Ellis of Moretonhampstead was buried in Chagford. This shifting of parishes between Moretonhampstead and Chagford suggests that the Ellises were living close to the parish boundary. 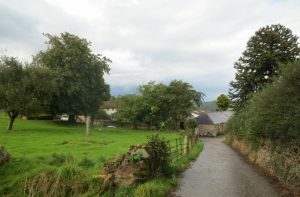 There are a number of references to the Ellis family at Sainthill Farm, close to the border between Moretonhampstead and Chagford. The farm is also associated with the Taverners. The Ellises’ daughter Elizabeth married William Taverner of Sainthill. There are two houses at Sainthill Farm. The Ellises may have been living in one and the Taverners in the other. Both Matthias and Matthew Ellis had children baptised in Moreton, but not in Chagford. Matthias and Joane had only one known child. Elizabeth’s birth is seven years after their marriage. The couple may have been living in another parish previously, and had other children baptised there. In 1721 Matthias Ellis appears on a list of freeholders of Moretonhampstead. Two years later, Mathias Ellis of Moretonhampstead went to Crokerton Well (Crockernwell), Cheriton Bishop, to swear an oath of loyalty, following a Jacobite plot to kill George I. He signed his own name. Matthias Ellis of Moretonhampstead was buried in Chagford on 2 Sep 1730. In 1733, Matthias Ellis, yeoman, again appears on the list of freeholders for Moretonhampstead. Either the burial in 1730 was for an older man, possibly Matthias’s father, or there was a younger man of that name. It is difficult to identify Joane’s burial. The Moretonhampstead and Chagford burial registers give very few personal details. There are several possibilities, both before and after Matthias’s death.